Getting wet on a hot day… it just doesn’t get any better than that. 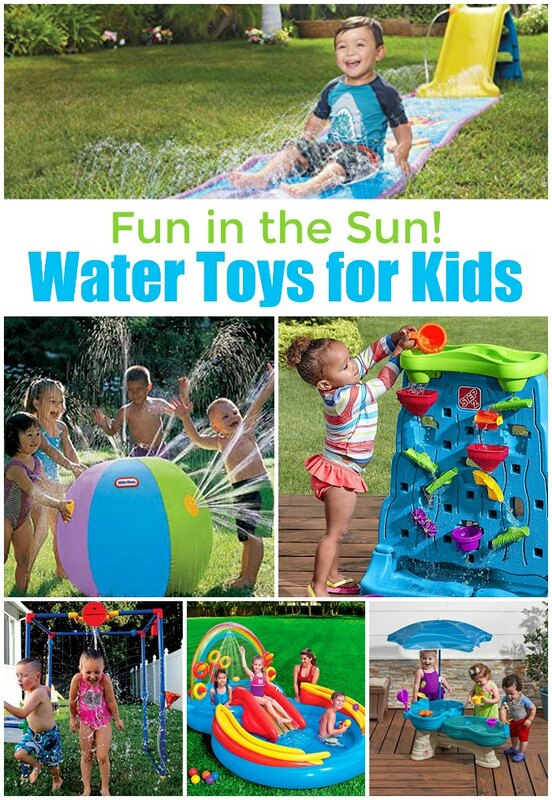 These water toys for kids are going to delight your little ones while keeping them busy and cool. One of my favorite summer memories is a sprinkler we had that shot water straight up. There was a plastic clown hat you would put on top of the stream and then try to run through the stream without the hat falling off. It was such a simple toy… but boy did my brother and I play in that thing for hours! Nowadays, kids have some of the coolest water toys around! I’m not saying I’m jealous or anything… but you’re going to want to play along. Trust me! This post contains affiliate links. 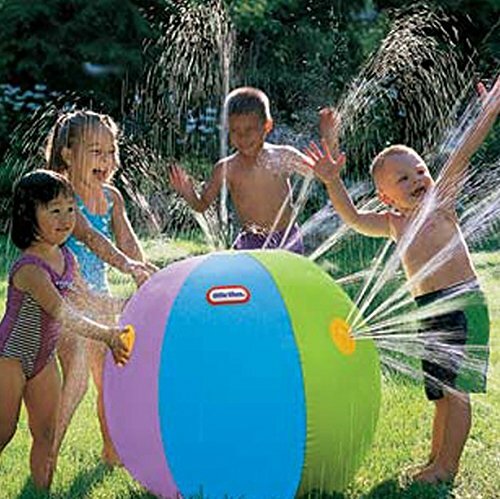 Inflatable Water Spray Beach Ball Sprinkler: Awarded parents’ choice award by parents’ choice foundation! Can be used in the pool, beach or on the grass,the inflatable ball shoots out streams of water from all sides, your children can run through the spray or play games trying to avoid getting wet. 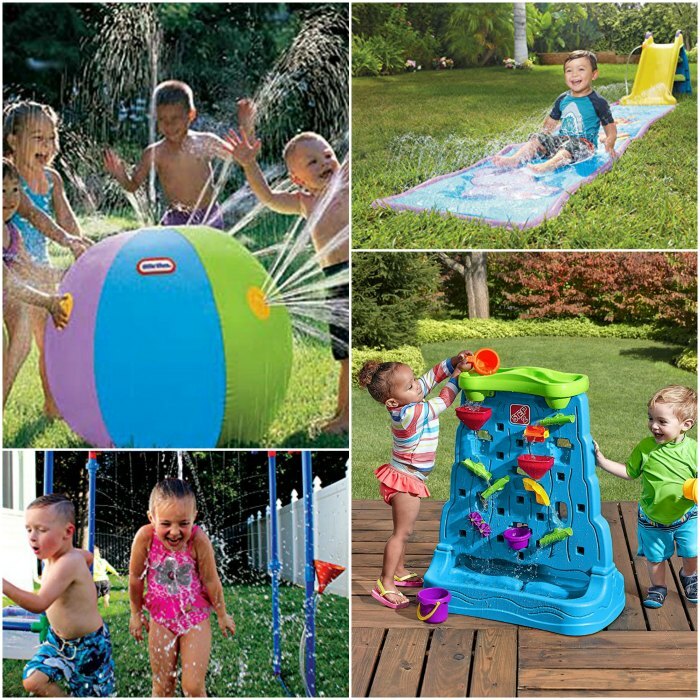 This cool sprinkler combines fast and fun beach ball action with wild water play. 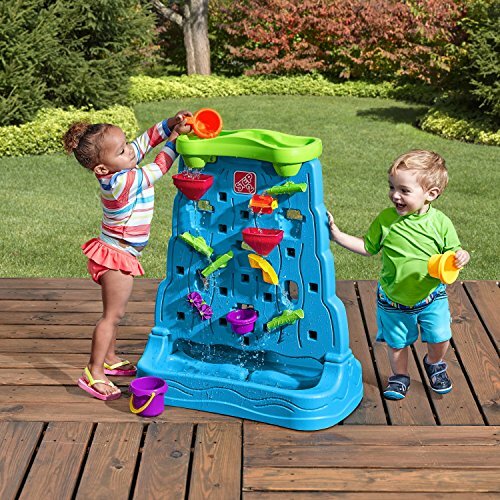 Step2 Waterfall Discovery Wall Playset: Little water fans will enjoy scooping the water and watching as it cascades through the zigzags, spinners and funnels on this two-sided water wall. 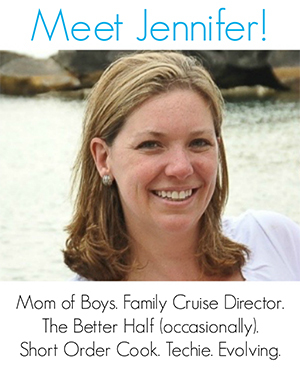 Kiddos can allow their imagination to run wild as each water maze piece can be moved to create a new design. Buckets Of Fun 6 in 1 Backyard Waterpark: Waterparks are a great way for young kids to cool down on a hot day. So, instead of planning, packing up the car, paying exorbitant entry fees, and chasing after your kids once you finally arrive, the whole family can enjoy a fun, stress-free day with the new Buckets of Fun 6-in-1 Backyard Waterpark. Buckets of Fun is a blast! It’s a safe, cost-effective way to keep your kids happy and cool in the convenience of your own private backyard waterpark. 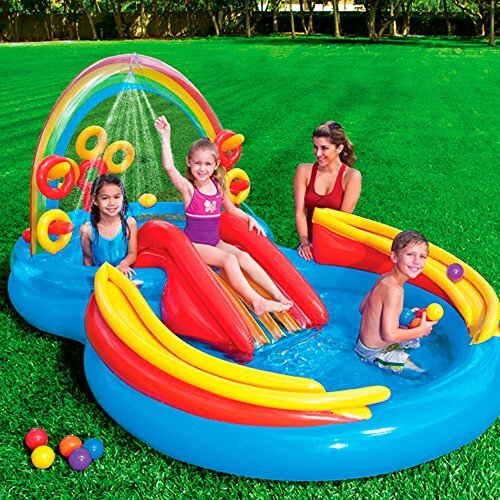 Intex Rainbow Ring Inflatable Play Center: Center includes water slide, wading pool, water sprayer, ring toss game (with 4 inflatable rings). 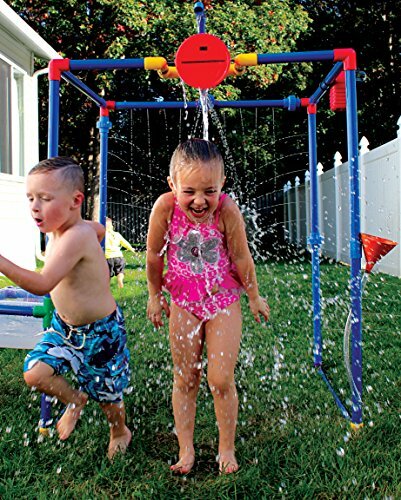 Plus water sprayer attaches to garden hose to keep kids cool in summer. 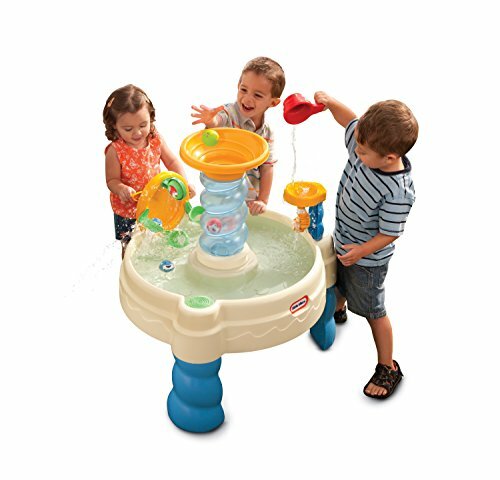 Step2 Spill & Splash Seaway Water Table: Little adventurers can create a cascading waterfall on this multi-level sensory play table. 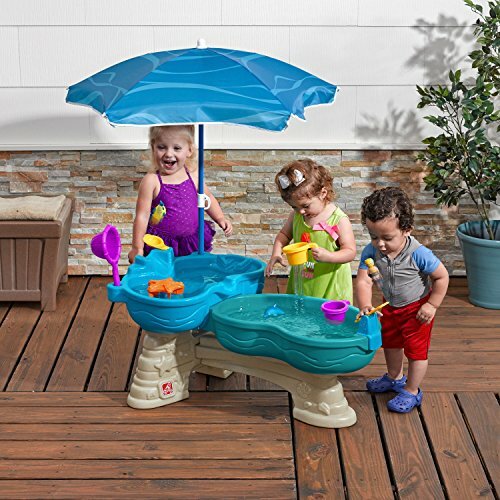 It’s the perfect outdoor toy for multiple children to splish and splash around in as they enhance their fine motor skills. 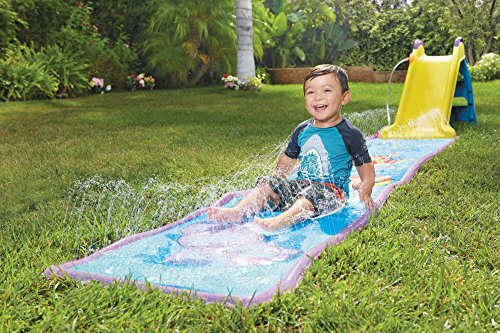 Little Tikes Wet & Dry First Slide with Slip Mat: Transform your backyard into a waterpark with Little Tikes! When the weather gets hot, your kids can cool off in a fun way by zooming down this water slide and slip mat. When the weather gets cooler, the slide works perfectly without water, too! 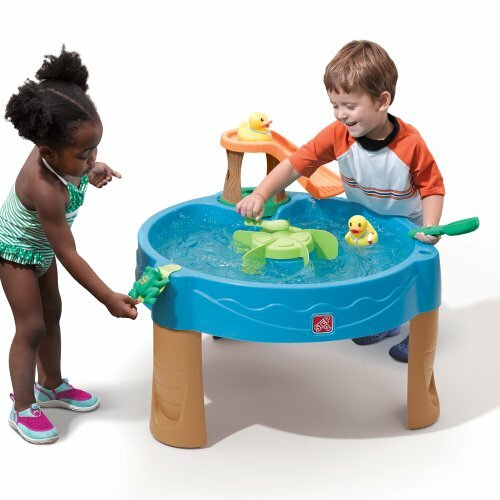 Step2 Duck Pond Water Table: This fantastic water play table will keep multiple children occupied with splashing fun. The pond-themed table includes 2 decorated ducks, a slide sized perfectly for them, a frog squirter, frog launcher and water spinner. Your kids will love turning the center spinner to get the water swirling and will have a blast launching the frog into the water. 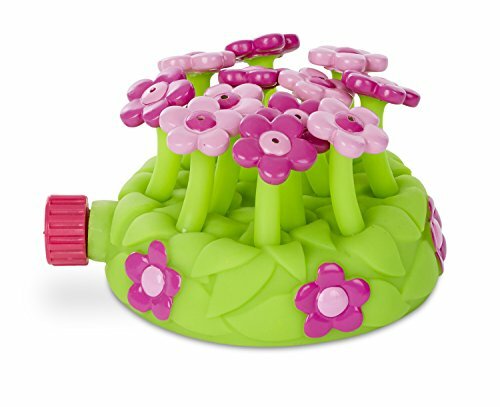 Melissa & Doug Sunny Patch Pretty Petals Flower Sprinkler Toy: Fun will bloom in an instant when this beautiful bouquet of flowers is connected to your garden hose. It’s easy to keep cool when this sprinkler goes into action! 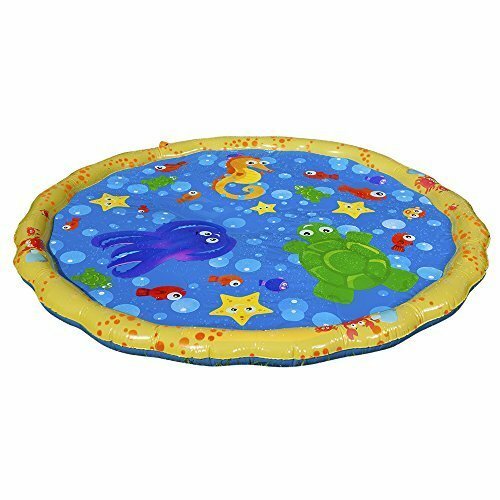 Sprinkle and Splash Play Mat: Perfect for little ones to gently splash and play in the water.